Is your yard riddled with dandelions? Instead of cursing those cute yellow moppet tops, consider harvesting the greens and flowers. Yes, my friends, you have real gold out there. What a great way to get your kids outside to play with the added benefit of picking your dandelions. From your harvest, you can make dandelion jelly (coming up on the blog,) enjoy the greens, or simply discard them. But first, let’s talk about how to get your kids dandelion pumped. 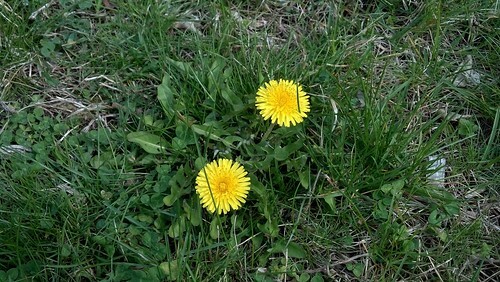 When I was young, my father would pay us $10 each to pick the dandelions. I guess his theory was if you pulled the flower head off, it couldn’t go to seed. No seeds, less dandelion. Worked for me as I pocketed the money. Since being small and closer to the ground, pulling the heads were fun. Now, that I am older with more parts that hurt, dandelion flower pulling isn’t an activity that I relish. Offer a prize for who can pick the most dandelions. Pay them by the bucket. Give little ones smaller buckets. Time them and make it a game. Create a treasure hunt so when they reach a certain amount in the bucket, they get another clue or treat. Turn the sprinkler on them as they pick the dandelions. My kids are teenagers so bribery won’t help unless it is in the form of a large plasma TV. They have their standards. However, there are young kids in the neighborhood who would love to get paid or given a treat to pick my dandelions. If you are going to make dandelion jelly, I would suggest to pull only fully opened flowers. If not, let them pull the buds too. Also, if you are pulling them, snap them off where the flower meets the stem. Otherwise, you will have to go through your bucket and snap off the stems to make jelly. So, what are you waiting for? Those dandelions aren’t getting any younger. Was I the only one who got paid to pick dandelions? Do you have a fun activity to encourage your kids to pick the dandelions? If dandelion picking isn’t your thing, then do you have a holistic way of ridding your lawn of them? Great picture of this flowers. Love it. I agree with you that if going to make dandelion jelly, I would suggest to pull only fully opened flowers. This can be a great outside activity that will last for many days and doing outside activities like this also teaches kids. Thanks for sharing this to us and i’m looking forward to read more from you. I hire my little ones to pick dandelions for me too. We make a number of things from the flowers like jelly, bread, and fritters as well as dye for fiber. It keeps them busy and is helpful to me. Then we’re all rewarded with a bread and jelly(we call it honey) treat afterwards.